We are lucky to have a guinea pig lover right next door! Jen is the one who visits with Grace and Ada every day when I’m not in town, making sure they get food, water, treats, and love. Jen’s dogs Goldie and Poppy are with us too. We talk a bit about the monthly guinea pig spa that’s put on by the Portland Guinea Pig Rescue. And Jen reminisces about her childhood guinea pig, Sunny. 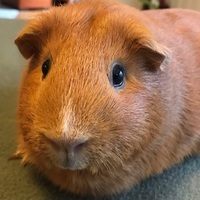 Production note: This recording was made in my dining room: two humans, two dogs, and two guinea pigs is a bit much for a handheld iPhone recording. I ended up bringing the audio file into Ferrite to do the editing. Then I uploaded the edited version to Wavelength to save me the steps of first submitting to Auphonic and then uploading to Micro.blog.